Just a girl who draws comics. Soooo a while back I sorta brought up the possibility of doing a livestream, and that didn't pan out. (Old laptop just wouldn't cooperate, grr.) Since then, I've upgraded, and recently someone asked if I'd do a sort of...process video, for some of the 'lineless' pieces I've been doing as of late. Shared it on the ol' tumblr blog, and figured I'd post it here as well. I also have a tumblr blog. If that's your thing. Could you please draw a big hero 6 pic? Just a suggestion! Love your art! 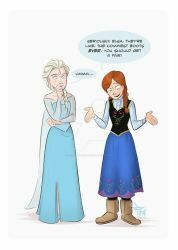 everything you draw that is Frozen-themed is absolutely amazing. just thought you should know. Oh my goodness, how could I not have found you on dA already. Your tumblr is the best thing since sliced bread. Hey! I stumbled on your gallery while searching for Re-Mind, and you've got some good stuff there! I wondered if you know about Tapastic already? I started a webcomic, Singmire Haze there and I'm really impressed with how satisfying the experience is. Tapastic is an awesome platform for comic artists and the community there is so nice and supportive! You can even eventually get some coin for your work.